The film isn’t about letting us in on Jobs’s secrets. It’s about perspective. UPDATE 9/4/2015— While Danny Boyle’s biopic Steve Jobs plays at the Telluride Film Festival this weekend, reviews are coming out for the wider release of the Alex Gibney–directed documentary Steve Jobs: The Man in the Machine. The A.V. Club calls it “sensationalistic,” while the Los Angeles Times found it “engrossing” and “unsparing.”, and the New York Times says “this isn’t the iPhone of documentaries.” The movie opens today—find showtimes in your area on Fandango. 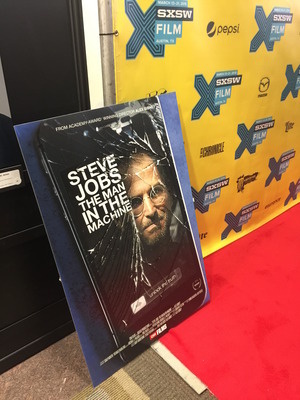 But we already saw it—Macworld’s Leah Yamshon got to view Steve Jobs: Man in the Machine back in March at SXSW. Her impressions are below (originally published here March 17), and she penned an interview with Gibney as well. Are you planning to see this movie, that even the director acknowledges Apple fans may not like? Let us know in the comments. AUSTIN—By this point, there isn’t much we don’t know about Steve Jobs and his story, but that didn’t stop filmmaker Alex Gibney from tackling Jobs as the subject of his latest documentary. And, spoiler alert, it shows off the ugly side of Jobs, painting an unflattering picture of tech’s most famous visionary. Steve Jobs: The Man in the Machine premiered during South by Southwest on Saturday, telling the story of Jobs through archival footage and new interviews with former friends and colleagues. This isn’t a strict cradle-to-grave documentary about Jobs’ entire life story: It’s more of an analytical look at Jobs and his troubled relationships and values, both in his work with Apple and in his personal life (and in the overlaps too). Gibney, who also narrates the film, sets out to discover why people mourned Jobs so intensely when he passed—what it was about Steve that resonated so deeply with the public. The film starts us off with Jobs’ death in October 2011, before jumping back to his earlier days. What the film lacked in eye-opening content, it made up for in perspective, and asks the audience to think critically about the connections we’ve forged with our Apple devices and what that means for human connectivity. Without revealing too much—Magnolia Pictures picked up the film for a wider distribution, so you’ll get a chance to see it sometime soon—here are four standout takeaways from the film. Gibney reached out to Jobs’ widow Laurene Powell Jobs and representatives at Apple, and both declined to be interviewed. According to Gibney, Apple declined because the company “didn’t have any resources available” for the project. Also missing: Steve Wozniak and Jobs’s children, though we do hear an essay from his daughter Lisa Brennan-Jobs. Lisa’s mother, Chrisann Brennan, was interviewed, sharing snippets from her child support battle with Jobs and his thwarted efforts to deny paternity. She also shares that Jobs wanted to name their daughter Claire, which she later learned was the name he had chosen for Apple’s next computer. Jobs changed the computer’s name after he and Brennan had chosen a name for their daughter—the Apple Lisa. It’s no secret that Jobs’ passion made him difficult to work with at times, and the film’s one-on-one interviews with Jobs’ former colleagues and friends just confirm this further. You’ll hear stories of Jobs controlling his relationships with the press. You’ll hear another story about how Steve took an employee’s resignation as an opportunity to put him on blast for messing up a product. Yet, all of them recognized Jobs’ brilliance and passion, and seemed to genuinely like and admire him despite some of these conflicts. The transcripts of Jobs’ SEC interviews have been publicly available for a while, but before this film was made, the footage had only been seen in court. Gibney gained access to this footage and threads it throughout the film, where we see a visibly irritated Jobs tackle the SEC’s questions about Apple’s practice of backdating stocks for employees. He answers every question asked, but he is obviously not happy about being there. Gibney sat down with Jason Chen, Jesus Diaz, and Brian Lam to hear Gizmodo’s side of the infamous iPhone 4 leak story—you remember that one, where someone found an early iPhone 4 prototype in a bar and sold it to Gizmodo. Chen tells a pretty harrowing tale: A few days after he personally returned the iPhone to Apple, he came home to find a team of police raiding his house and seizing a lot of his personal stuff, under a warrant. The police task force was from California’s Rapid Enforcement Allied Computer Team, a team rumored to be in the back pockets of major Silicon Valley companies to perform corporate investigations. As 9to5Mac points out, “Former Gawker legal head Gaby Darbyshire, who was involved in the controversy, is notably one of the film’s producers.” Notable indeed. If you’ve read Walter Isaacson’s Steve Jobs, there won’t be much in The Man in the Machine that will surprise you. Sure, you’ll see new interviews about Jobs, explore Apple’s complicated (and sometimes shady) tax practices, and be reminded of the struggles of Foxconn—but these are stories that have been told before elsewhere. The film isn’t about letting us in on Jobs’s secrets. It’s about perspective. It asks interesting questions, yet doesn’t specifically answer them, letting you as an audience member form your own opinion about what made Steve Jobs such an icon.